At about six months of age, you should take your baby to your eye doctor for his or her first thorough eye examination. Things that the optometrist will test for include excessive or unequal amounts of nearsightedness, farsightedness, or astigmatism. The doctor will also test eye movement ability as well as check for eye health problems. These problems are not common, but it is important to identify children who have them at this stage. 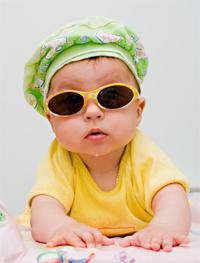 Vision development and eye health problems can be more easily corrected if treatment is begun early. Unless you notice a need, or your eye doctor advises you otherwise, your child's next examination should be around age three and then again before he or she enters school. During the first four months of life, your baby should begin to follow moving objects with their eyes and reach for things, first by chance and later more accurately as hand-eye coordination and depth perception begin to develop. To help, use a nightlight or other dim lamp in your baby's room; change the crib's position frequently and your child's position in it. 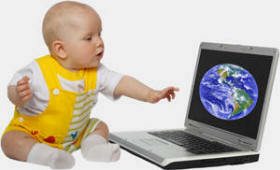 Keep reach-and-touch toys within your baby's focus, about eight to twelve inches. Also talk to your baby as you walk around the room; alternate right and left sides with each feeding; and hang a mobile above and outside the crib. There are many other affectionate and loving ways in which you can aid your baby's vision development. Use your creativity and imagination. Ask your eye doctor to suggest other specific activities.